I’ll probably save the tomato seeds for next year. I have way too many tomato plants this year. I can probably start some Savoy cabbage this season but we’ll see. I might wait until Fall to start these off. It was really hot on Sunday, around 90 degrees and as a result, my plants suffered. I looked in my backyard after church and they were all wilty except for some plants I had in pots. I was amazed at how fast it can turn from good to bad to worst. I just watered everything on Saturday and everything was wilting the next afternoon. I now make it a point to water every morning. Well that’s all for now. I plan on transplanting this afternoon. I neglected planting on Sunday since it was so warm so I’ll do it this afternoon (it’ll only be around 75 degrees). Happy gardening everyone! Today involved a little gardening. It was windy and very gusty at times. I had to take most of my plants off the fence so they wouldn’t blow off. The radish plants I planted in November are finally flowering. I can’t wait until they finally get to seed so I can rip them out and plant something else. It seems like it takes so long for things to ripen to seed. I have several Bok choi plants that are ready to seed but they’re still green and not ready to pick yet. I plan on planting some peppers in their spots but right now the peppers aren’t too bothered being in their transplant pots. Once I see roots poking out of the drainage holes, I’ll be concerned and maybe move the Bok choi to a different location. We’ll see how the season progresses. Today was just a simple day of gardening: watering all the veggies and flowers, walking around looking at the bok choy seed pods, and…urgh picking snails off my precious peas! I hate snails with a vegence! They’re annoying little buggers. I’ve tried about everything to get rid of them: coffee, coffee grounds, copper, etc etc etc. Today, I crushed a bunch of egg shells and put them in front of my peas and the other stuff they like to munch on. The crushed egg shells are suppose to hurt their bellies and deter them. I hope this will prevent them from crawling all over my peas and eating them to the nubs. On another note, my scarlett runner beans, sequioa beans, swiss chard, radish and lime basil I planted a couple of days ago have sprouted and are doing well. I planted out the scarlett runner and sequioa beans this afternoon. I put some in the ground and some in pots, just in case we move too soon, I want some beans to come with me. This morning, I also staked my tomatoes I have in containers. 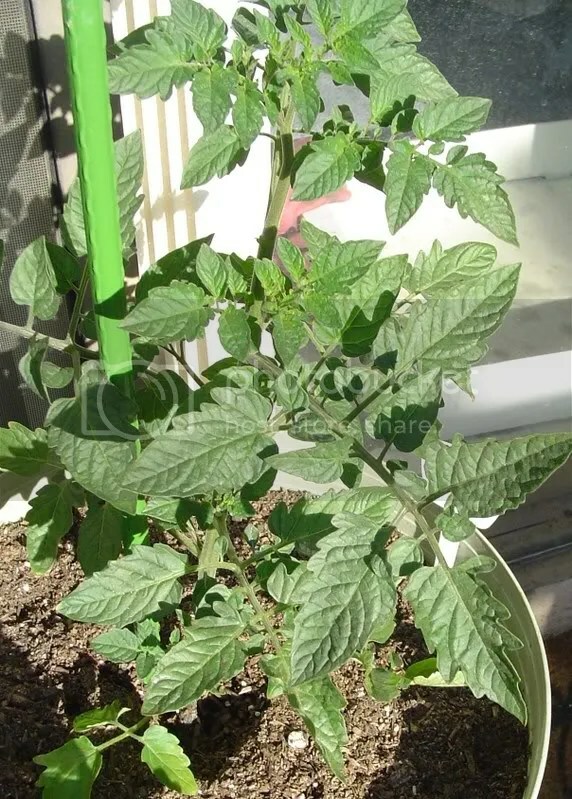 I have a supersweet, gardener’s delight and ladybug hybrid tomatoes in pots. 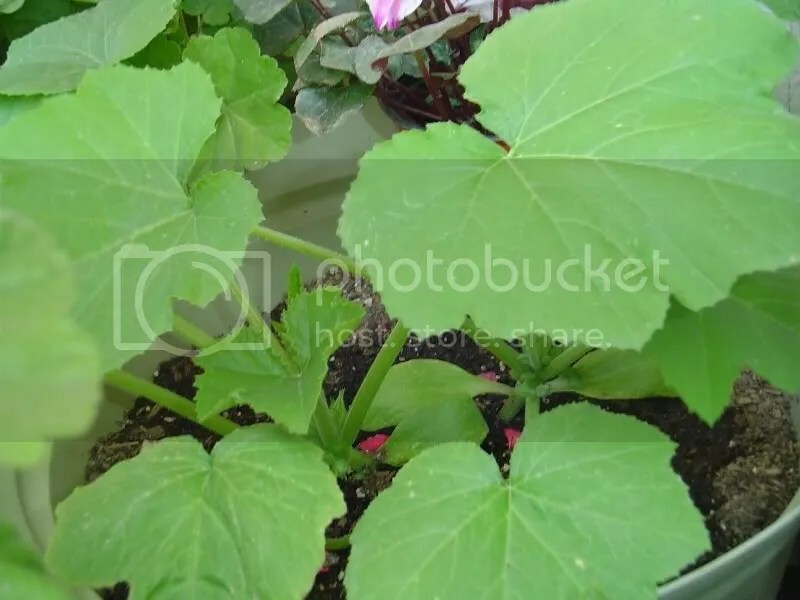 I noticed that I have flowers forming on my squash seedlings. Eek. so exciting. I’ve had tomato flowers for awhile now (probably in the past 2-3 weeks) and I can’t wait to have tomatoes. Yummy! Yesterday, I visited my parents and little brother and came home with tons of Asian groceries, Bento boxes, and some gardening pots and a garden hose. I have a neat blue pot that they gave me since they weren’t using it. 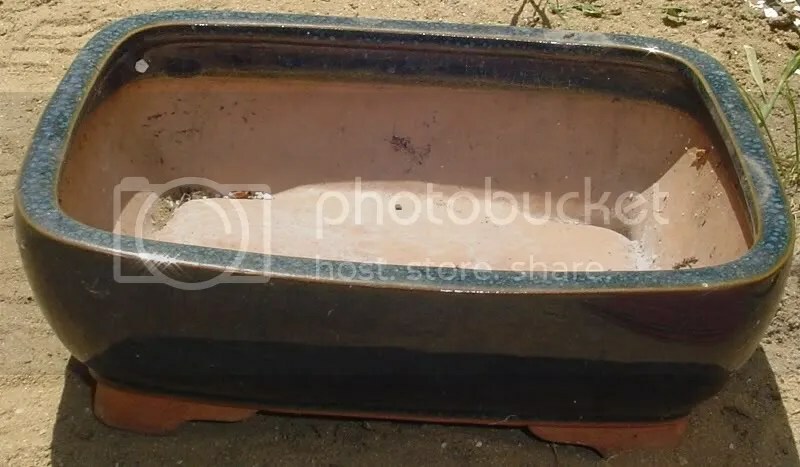 It’s a rectangular pot that sits 4 inches tall and probably 6 inches wide. I’ll take a picture tomorrow and post it. I think I’ll put some low growing plants in it. I don’t want something that will take away from its pretty “pot” beauty. My co-worker gave me two apricot seedling and a lilac plant. It was a nice gesture from her. I had given her some tomatoes, peppers, bok choi, and squash seedlings I had extra of and she came back and gave me some plants. She’s so nice and very kind. Tomorrow, I plan on continuing the acts of kindness by giving her an avocado plant I had started from a pit and some seeds I know she’ll enjoy (bok choi, sunflowers-tall, catnip-for her cats, basil, and California poppies). Tomorrow, I plan on giving everyone a good soaking with fish emulsion. Hopefully the cats don’t get wind of it or else it’s going to be a full house. I also want to plant some of the bean seedlings I started indoors. For errands, I have to bike over to the Library and pay our electricity bill. Gee how fun uhh? Well, it kind of is since I’m biking. I love biking! Happy gardening everyone.